When I got hooked on orienteering in the 1990's chasing start middle distances were what hooked me. The pure orienteering challenge in the morning followed by the excitement on tired legs in the afternoon. I vividly remember Shaun Collins sprinting to his only National elite title on the limestone of Piopio and looking forward to racing this format as an elite. 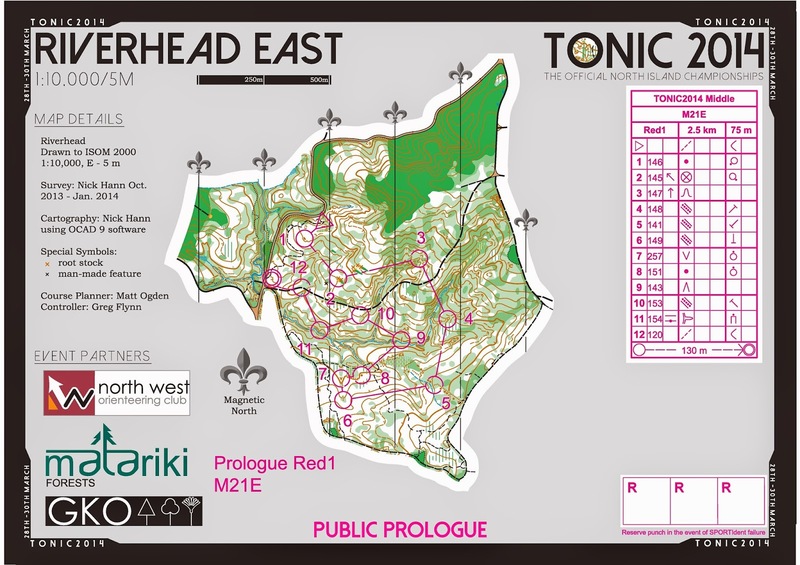 Unfortunately fashions change and I have only raced this format a handful of times this century, but this one, the middle distance at TONIC 2014 was certainly one to remember. I managed to ekk out a decent result in the morning race, more by good fortune than well executed orienteering. Mistakes at 3 and 5 where I drifted off my compass were made up for by the advantage of forming a pack with Nick Smith and Tom Reynolds. Their aggression through terrain gained me minutes I would otherwise have squandered. They boosted me to 4th place, an enjoyable lunch, with the top three within my reach. Brent Edwards with a rare elite victory was only 2 minutes up, while Tom Reynolds and Duncan Morrison filled the gaps. With a group like that up front I was comfortable that no one else was likely to contend. The JWOC candidates raced first in the afternoon, and I must confess to some trepidation watching their results come through. I needed to remind myself that while I seldom orienteer in difficult terrain I have and can do it. The accumulated lessons/scars of Japan, Australia and France have given me some clues to green gully spur terrain. I lined up for the start feeling comfortable and focused. My only mental technique for the start currently is to focus on how eager I am to pick up the map, to read it, to make the first connection with the terrain. I want the map, I want the map, I want the map. I was very conscious of the run to the start triangle, and how even a brief foray above an aerobic threshold can lead to bad decisions. So I took it steady and went the safe way using the track to the left and attacking off the knoll. This lost me 30 seconds to Duncan. He must have pushed hard. No 2 looked harder than it was. Run hard on a compass and stay on the left of the broad gully as it nears the stream and you would be unlucky to miss it. I played it a little safer than this staying right on the white spur then cutting across left near the end, taking the time to read my way into the circle smoothly. No 3 I ran hard on a compass, the obvious backstop of the creek and the clear visibility near the control gave me a degree of confidence. No 4 proved to be a game changer. There are parallel hills both left and right of the control circle meaning that you had to very careful with direction as you entered the circle. Brent, Tom and Duncan all drifted left and spent time searching the hill above the control. I took a careful choice to approach the control up the white spur and was rewarded by hearing them crashing around like wild pigs ahead of me. They punched twenty seconds ahead, game on. Behind me this control also accounted for the majority of the chasing pack, a good hit rate for a relatively innocuous challenge. A short leg 5, chasing down the boys lead into a longer leg across the slope to 6. Heading up the track I saw the pack had split with Brent and Tom heading straight while Duncan stuck on the track looking for the route choice to the right. I took up the challenge of trying to run Duncan down on the track. My strengths are not in terrain at the moment and I thought the choice looked pretty even. Nearing the control flashes of colour in the forest below us confirmed that there wasn't much in it. Duncan and I hit the line of knolls and headed down hesitating when we bumped into Brent letting Tom get a little bit of a gap. I liked this long leg for a middle distance race, it gave us a chance to up the speed a little, and let the fit, aggressive runner get a small edge. Heading out of 6 then I was running 3rd trusting Brents compass as we ran Tom down. This control could have been a disaster but the boys did well and we spiked it. We were clearly the fastest in the field for this split the advantage of pack running and sharing some risk around. Brent led through 8 and 9 doing especially well on the latter, exiting leftish out of 9 to save getting tangled up in the index contour gully and funnel us up the broad gully to the top of the ditch which was easy to follow down to the control. Hitting the spur which hid 10 Brent headed right and I went left hitting the control and the lead for the first (and only) time. It was here I made my biggest mistake planting the accelerator down the spur towards 11. I read into the control comfortably and fast but didn't invest enough time into the next leg, one glance told me I could just run down the creek...a better look would have let me know that climbing out left onto the track was going to be significantly better. This look would have taken a few seconds, but not taking it ended up losing me the race. As I ploughed down the creek, followed eagerly by Brent and Duncan, cunning Tom Reynolds made the right call, hit the track and we never saw him again. I should have used the easy running down the white spur from 10 to plan ahead and make sure opportunities like this weren't missed. Passing through the run through Brent and I were still together with Duncan dropping off the back. We suffered together up the hill to 13, before coming to grief again at 14 where we must have missed the control sitting high in a gully by a fraction. Looping back I punched first just as Duncan appeared, and began my finish sprint too early promptly running into the white gully to the left of 15, a classic course setters trap (I reckon they deliberately made this gully small on the map to trick me into it). By the time I sorted myself out Duncan and Brent were gone on their extended battle to the finish which apparently ended with a spectacular dive to the line just taken out by Duncan. I was left to steadily pick off the last few controls making sure no challengers picked me up from the back. All in all a reallly fun race, with lots of lessons learnt and re-learnt. This race was a highlight of a weekend for me that was very motivational watching future stars thrash it out in the JWOC trial. Good to see Shamus Morrison and Danielle Goodall staring, as I'm sure they will many times again. I remember a few years telling Shamus then struggling miles behind Nick Hann and Tim Robertson in the local school scene (no disgrace there), that if he hung in there and got closer and closer his time would come. He has hung in and now his time is beginning. 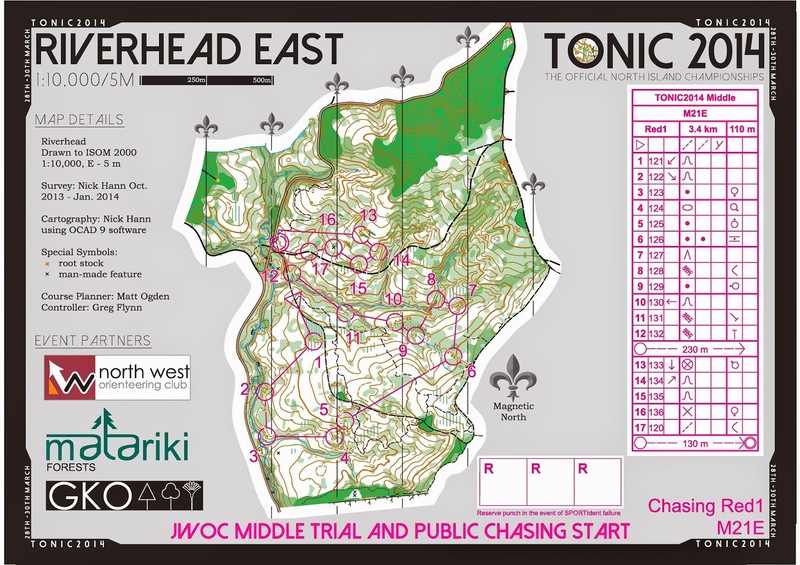 Hopefully we have plenty more great courses and maps like those from the last weekend to test ourselves on.